Laughing Stock Vineyards Archives - Write for Wine: It's Wine O'Clock Somewhere!Write for Wine: It's Wine O'Clock Somewhere! Colour VQA Wines from B.C. Wines of British Columbia recently showcased the fall releases of more than 350 B.C. wines, poured by 90 wineries at the Vancouver Convention Center at an event called “Colour.” Only VQA wines were sampled — the Vintners Quality Alliance standard was created in 1990 to guarantee consumers they were drinking wine made from 100% B.C.-grown grapes. In 1990, B.C. was home to 17 wineries; today there are 275. 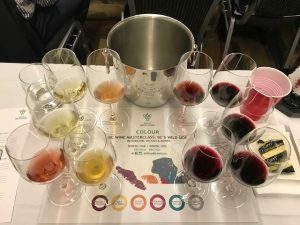 Prior to Wines of British Columbia‘s fall release “Colour” event in Vancouver (described in a separate post), we were invited to attend a wine seminar called “B.C.’s Wild Side” led by moderator and B.C. wine expert Michaela Morris. The exclusive tasting focused on organic, biodynamic and natural B.C. wines, looking at how some wineries use wild fermentation, skin contact and ancestral winemaking techniques. Ten wines from Okanagan Valley, Similkameen Valley and Golden Mile Bench were tasted; three were pre-release samples, and unfortunately, a couple of wines are already sold out.